Over two-thirds of a carat of diamonds curve in unison to create a sparkling symbol of affection. These 23 channel-set stones work in harmony to form the outline of a graceful heart, an ideal expression of the brilliance of your love. The 14K yellow gold from which this romantic pendant is formed adds a warm, sunny shine to this timeless symbol of affection. A coordinating 18-inch box chain completes this piece and renders it ready for giving the moment you receive it. 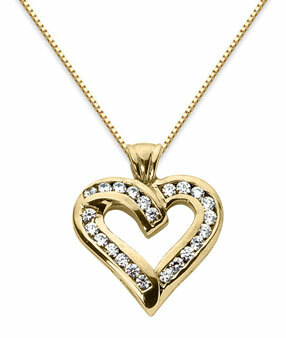 We guarantee our Diamond Heart Pendant, 14K Yellow Gold to be high quality, authentic jewelry, as described above.